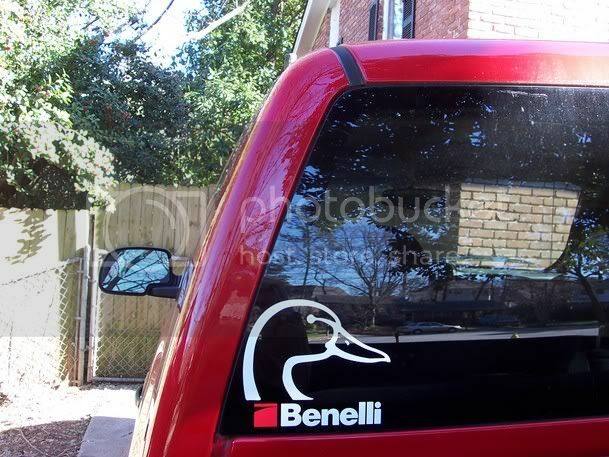 I thought I would show everybody the decals I put on my truck today. Am I seeing stovepiped Kent?! I bet I won't sleep a wink tonight! For weeks, we've been watching 500-600 honkers stream over our heads every AM on their way to feed at a turf farm (for which I did the website). I just got the call, and we're going to shoot them tomorrow morning! This is the first time they've been shot all year. There are about 15 shooters invited, the limit is five per shooter, and we'll be right where they were landing this morning. One pit blind and mucho laydowns. YOU BETTER POST PICS! Good luck! I just checked the camera to make sure the batteries are fresh and everything's working well. They've been going in there in groups ranging from 12 to 100. The flights I've seen have been beginning around 8:00 Am and continuing for about an hour or so. Tuck, what loads and choke do you use? Are those Green head gear full body mallards? It didn't turn out as well as I'd hoped, but still not too bad. We hunted a corn field bordered by a huge pond. The first flight was one of the biggest, with around 40 birds in it. It was early and grey, and they circled and began to slowly drop in. A skybuster rookie in the pit blind opened fire WAY too quickly and they flared up and out. We got one (the rookie missed). Should have had an easy dozen. The rookie was talked to, and we waited for the next group. Subsequent groups ranged from three to twenty birds, but none of them looked as though they wanted to settle in properly. I was thinking we'd be using laydowns, but we had some one man portables that were just put out yesterday, and I think they were spooking, just because the landscape looked changed to them. We got some decent shots, and we ended up with a dozen birds down. My buddy was going back with the dog and a boat to collect the rest that had drifted too far out into the huge pond for the dog to mark. The new blinds were left out, and they should be settled again in a few days. Four of these were at the hands of my SBEII. In fairness to the others, I've had much more goose shooting this year than they have, and my eye is right. It's just two of us going this Saturday, so you're welcome to make the drive and join us. If you leave Friday after work and have good luck with the DC traffic, you should be here by the time we shove off. I was shooting 3" Win. X-pert Hi Velocity BB's through a Primos "Dead Zone Decoy" extended tube. How do you like that choke tube , I was thinkin about getting the decoy and pass choke of of ebeay for my M1. They've been doing great for me. What is the white'ish headed one? Still a Canadian, but younger? Or something else? wow due to ridiculously warm temps the north east has been prouducing vary little waterfowl action. I didn't know new york was horth east.? Just kidding but today was a great sea duck day . Boothbay held plenty of ida's for us this morning. Seas were 5-8 feet ,rough tending when they tried to get away. Last saturday for Mainer's .Hope everyone enjoyed there season. The whitish headed one appeared to be some sort of a mixed breed. He was big, with a large head and more orange colored feet than a typical Canada. After all of that effort towards packing the boat, we ended up not going goose hunting after all. Instead, we loaded up my buddy's ARGO and headed for the bowels of a massive swamp. I don't have any pics but did better this year than the past two or three years. I only went out on 10 or so trips. Shot a limit on two of the trips and shot two banded birds, one of which was so worn I could only read three numbers. I'm sending it back to Maryland to have them acid wash it. Shot a variety of birds - mallards, pintails, teal, and a few widgeon. The season just ended in California and I'll be heading down to Mexico in a couple of weeks to shoot the ones I missed! I could have guessed you'd be the guy to watch out for when someone was taking a leak.